« What else I have been doing. I was fishing, and I fished up some port from some wreckage, and then there was more port, and then on occasion I’ll get some Rumsey Rum, that promises to give me +10 stamina for 15 min and gets me drunk to boot! One of the first quests you do when you hit Stormwind sends you to the Winery for some wine. 16 silver for a Jug of Boubon. Sweet! We have festivals that provide us with free booze, kegs and flagons for everyone! When selecting what cooking receipe I was to get next I could have got an alcohol making one, but I couldn’t think of a good enough reason to want to be able to slip my hand in my Enlarged Onyxia backpack and pull out some alcohol. Quietly having a little sip. If you have ever done the Wildhammer Dailys in Twighlight Highlands collecting their beer makes you drunk, and it’s bloody annoying. I’m trying to work, make gold, and do questing, and here is my flying mount flying off into all sorts of weird directions. We have alcohol available to us in all sorts of places, it’s cheap, your screen goes funny, and the entire world gets little announcements. * blah* is getting tipsy. It’s kind of like alcohol advertising. So Why don’t we drink more? and then I kept drinking until I “Drunken Vomited” several times It was kind of gross, Then I passed out in front of a Keg. Real classy. I don’t remember there ever being concern about the availability of intoxicating beverages in Wow. I personally find it annoying , the affects interferes with my gameplay, I also don’t want to be the Shadow Priest that hangs out in Stormwind drunk all the time, because any passerby gets told. “Zahraah is tipsy on..” and Being Drunk in Wow isn’t cool. Do younger players think ” Woot! I am drunk!” Hahahah! cause surely we would see more drunk people around given the amount of younger players that play. 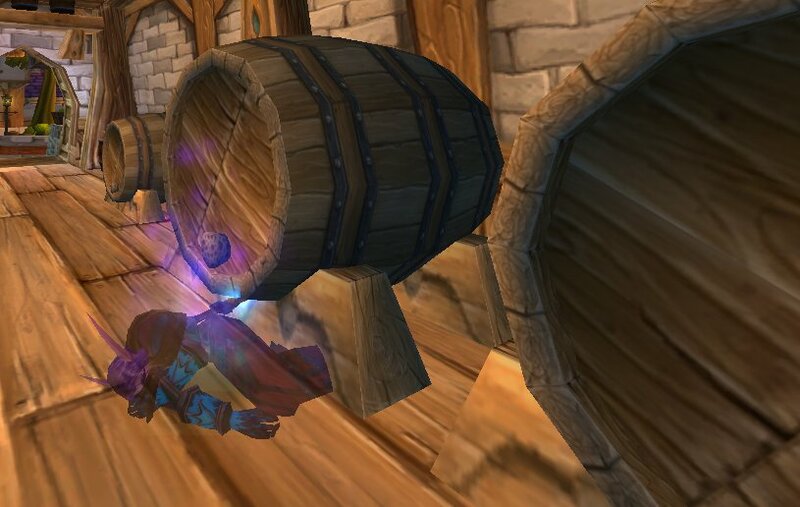 I don’t get the impression that alcohol is a big deal at all in Wow, and I think regardless of its availability, what it stands for in real life, that getting drunk in game is more an annoyance then it is “for fun” we know the difference between real life and virtual worlds. Given the opportunity to misbehave, most people don’t. So why would we not be able to tell the difference when it comes to violence and drugs in games? Back in the day, being drunk used to make it look like mobs went down a couple of levels. So a level 37 elite would look like a level 35 elite… But only to the drunk person. I called it “beer muscles”. I don’t know if that’s still the case… I avoid drinking in game and in real life and it’s been a while since I got a weird effect from a mob or was sitting next to a person whose character was drunk.